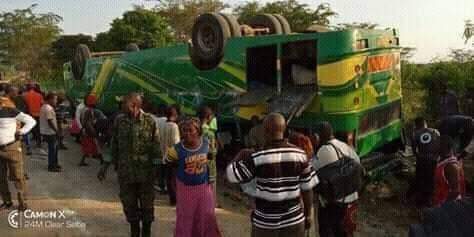 KASESE- A passenger bus belonging to Link Bus Services has been involved in an accident at Kikorongo, Kasese-Mbarara road, on it’s way from Bwera to Kampala. The tragic scene happened at about 8 am on Thursday morning, police say. Mr Emilian Kayima has confirmed the incident but said he would give details later. “Yes, Information has just come in. We will communicate to you later about the details,” he said in telephone interview. However emerging reports indicate that 21 people are believed to have died with several others battling severe injuries. The Link bus was coming from Bwera town with about 65 people on board.